To learn more, read the full book. 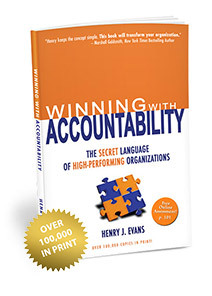 In this chapter, you will discover that as you apply the Language of Accountability, you will model it for your team and others you work with. Eventually, it will be a natural process. Your accountability culture begins … not with the organization changing as a whole but, instead, with the language that you as an individual choose to use. It is through individual change that organizational change occurs and the change begins with you! Max failed because there was specificity missing in every expectation and assignment. Nothing was clearly stated at the front end … and when there’s no specificity on the front end, Max was set up to fail. But, let’s not throw Max’s boss under the bus just yet. Max made a big mistake, as well. He “assumed” he knew what the boss meant when he was told to “do a good job” and to get the report completed “as soon as you can.” Assumptions dig deep potholes and are great contributors to accountability gaps leading to a failed project or relationship … and these lead to bad feelings, which become a vicious cycle of dysfunction. Accountability is a two-way street. If you complete a task that was not specific and someone is disappointed in your work, you are the one who is considered unreliable. You’re past the point of no return. It’s too late for expectations. It’s a “gotcha” of the worst kind in every sense. Thank you for reading the first (of three) installments of chapter three. Next month, we’ll continue with more free content from our best selling book “Winning With Accountability, The Secret Language of High Performing Organizations“. In that article, we will expose the “glossary of failure”™, or put simply: the language which leads to relationship and project failure. For more information about Winning With Accountability, the book that introduces the simple method to help any individual build Accountability in to their culture in an emotionally intelligent way, click here. With the global success of our best-selling book “Winning With Accountability, The Secret Language of High Performing Organizations” (now in its fifth edition) we are giving you the third chapter in three installments. In this, the first installment, we are sharing the “Language of Accountability”.